As it turns out, the discovery of the illegal plane and airstrip on August 13, last, at Santa Fe, Region Nine was not the first time Lethem businessman, Shawn Hutson Singh, was fingered in facilitating the construction of unauthorized runway and the landing of aircrafts. Singh only turned himself in less than a week ago after fleeing the jurisdiction following the discovery of the Beechcraft twin-engine aircraft. In September 13, 2016 the foreign aircraft was discovered by the Guyana Police Force (GPF), partly covered near the village of Yupukari, Region Nine. A Commission of Inquiry was subsequently constituted for the purpose of investigating, examining, advising and reporting all the circumstances in which the aircraft entered the country. 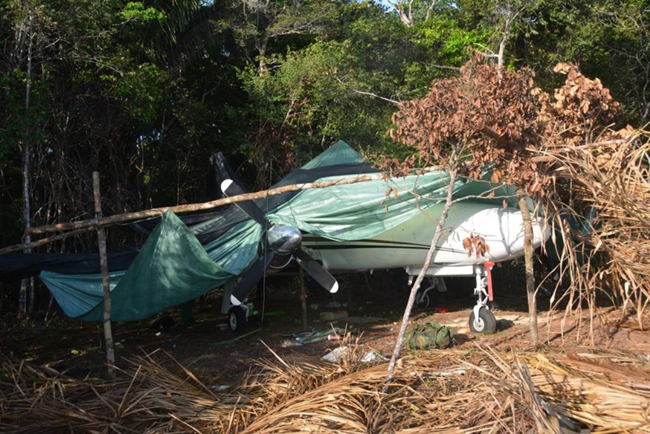 During investigation, it was revealed that Singh, who is a resident of Tabatinga, Housing Scheme, Lethem, was seen on a regular basis in the area where the discovery was made—that is, before and after the plane landed. The COI stated that the businessman would bribe farmers in the area with food items in return for them to remain quiet. Singh allegedly told the farmers to keep the information to themselves because the persons who were involved were armed and dangerous. The businessman was linked to several illegal aircraft landings at Parabara, Manwar, Mountain Point and Mandakara airstrip. According to the COI report, the illegal plane was piloted by a tall “white” man (a Brazilian) and accompanied by a short, slim woman believed to be a Colombian with long black hair. In 2015, a Mexican purchased the plane from a US owner. After it departed the United States, investigators found it hard to trace its activities. The plane could only be accounted for when it departed Colombia for Guyana. On the day it arrived here, the COI found that the aircraft developed a port engine failure causing the pilot to attempt a restart (air-start). When that failed, and knowing that the pressurization of the aircraft at that height required both engines to function, the pilot made an emergency descent to a lower level he considered to be safe. The COI report further stated that the plane continued along its flight path limping on one-engine until it landed on an illegal airstrip in Guyana. It entered the country’s airspace undetected by any of the state agencies who had that responsibility. Presently, investigation is ongoing in the discovery of the illegal plane at Santa Fe. Nathan Hamilton, 21, of Lot 107 Beverley Hills Drive, Lethem, and Wazim King, 37, also of Lethem were charged with the construction of the airstrip. They reportedly conspired with the prime suspect to facilitate the illegal landing of an aircraft suspected to be involved in trafficking in narcotics and firearm, in an unauthorised port of entry.